The wedding planning industry has changed over the last few years from primarily charging a percentage of the cost of the wedding to charging a flat fee based on the services offered. Consulting packages typically are billed by the hour and consist of the client sitting down with the wedding planner and asking questions based on the area or areas they need help in. This may be pulling together design ideas, confirming or suggesting vendor or venue choices or ensuring that the client is on track and has not forgotten anything. These types of meetings typically take place early in the planning process. These meetings are a great opportunity for the wedding planner to upsell the client and recommend a Day of Coordination or even a Full Service wedding package. Luckily for you, many times the client will realize they really do need more help than they had originally thought. However, these recommendations should be reserved until after the session has completed, as the client is paying you for your expertise, not your sales pitch. The typical hourly cost of Consulting is $40-$60 per hour for a fairly new planner or one in the south or a rural area. In a larger metropolitan area like New York City or Boston, or for a very well-established and experienced wedding planner the fee can reach $100-$150 per hour, and I’ve even heard of fees even going beyond that (yes, I’m serious). Day of Coordination is meant for the bride who wants full responsibility for planning her own wedding, but could still use a helping hand on wedding day to ensure that her vision becomes a reality. Although this package is typically booked well in advance of the wedding, the wedding planner does not get involved until 1-2 weeks prior to wedding day. Don’t let the name fool you: as a day of coordinator, you’ve got your hands full. Responsibilities include creating a detailed timeline, contacting the vendors for formal introductions, checking timelines confirming day of contact information and reviewing copies of all contracts to clarify all contractual obligations of all vendors. After discussing the client’s vision for their ceremony, the wedding planner would be in charge of running the wedding rehearsal. And on the day of the wedding their responsibilities would be to be present at the venue and ensure every detail is set up the way the client has envisioned it. As a Day Of Coordinator, you should also be the liaison between the bride and the vendors for the day. This greatly relieves the bride of unnecessary stress, which is, in a nutshell what being a wedding planner is really all about. During the ceremony and reception the wedding planner’s responsibility is to ensure everything runs smoothly. The goal is to adhere to the timeline, but in the event that this isn’t possible (and that will happen more often than you think! ), it is the wedding planner’s responsibility to ensure that events are rearranged in such a way that incurs minimal cost and stress to the bride, groom, their families and their guests. The package cost for Day of Coordination can vary widely depending on the area of the country, the size of the wedding and if there are one or two locations. A basic Day of Coordination package in the south or a rural area would typically run $600-$900 depending on the size of the wedding and the number of locations. The wedding planner alone can typically do a wedding with 100 guests with the ceremony and reception in the same location. However, a wedding of 200+ guests or with the ceremony and reception in separate locations would require an assistant, which would naturally increase the price. In larger metropolitan areas, or for a very well established and experienced wedding planner, the package price for Day of Coordination would typically be $1,200-$1,800. Typically these high-end planners will always have an assistant but will charge additional for two locations and larger numbers of guests. These are the clients you want to work with. Many wedding planners who are well-established will only do full service since this gives them full control of the look and feel of the wedding that they are putting their names (and reputations) on. In this package, the wedding planner is practically running the show from conception to execution. Full service wedding planners recommend the vendors, which gives them the opportunity to work with vendors they are familiar with and can trust. They also typically are very involved with the planning of the décor, flowers, linens, rentals and printed materials. They also take care of all of the details included in the Day of Coordination package. 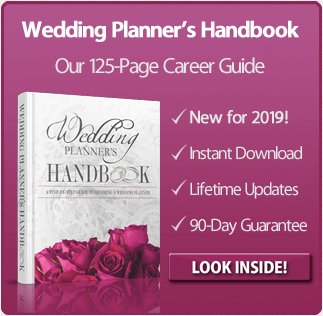 Clients often prefer the Full Service Wedding Planner package since it offers the best opportunity for them to take full advantage of a wedding planner’s expertise and purchasing power, since many vendors offer discounts to preferred planners. With an experienced wedding planner at the helm, the couple can be ensured that the wedding will flow seamlessly from the Save the Dates to the Bride and Groom’s Exit. As in the Day of Coordination package, additional fees are typically charged for more than one location or for larger weddings. A Full Service Wedding package will run $2,000-$3,000 in the south and more rural areas or for less experienced wedding planners. In larger metro areas or for more experienced wedding planners, Full Service Wedding packages can run $3500-$5,000 if the client is also involved and $5,000-$10,000 if the client is not. According to The Association of Bridal Consultants, the average total cost for a wedding consultant is $3,636 in the northeast and $2,635 in the south. The national average is $3,262. 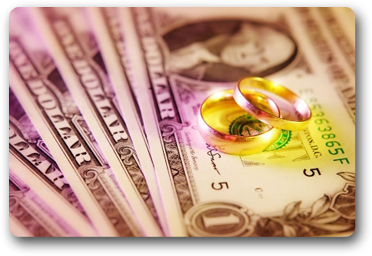 Regardless of what you decide to charge, be sure to first compare the prices of other wedding planners in your area. A good rule of thumb is to first decide if you want to cater to the everyday couple who want to have the night of their lives without breaking the bank or to exclusively high-end clients who want to “Wow” their guests with an extravagant wedding. Then simply price your services accordingly within the range of what your competitors are charging for the same services. There are pros and cons to both sides: the high end wedding planner will work just has hard as the average wedding planner but get paid twice the amount. But the average wedding planner will cater to a much greater number of potential clients, which will keep the phone ringing and the schedule filled. The choice is yours! Previous post: Wedding Planner School: Do You Need It? Next post: How Much Do Wedding Planners Make?